Carnival is partnering with entertainment innovator IMAX® (NYSE: IMAX) to bring the world’s most immersive cinematic experience to sea with the first-ever IMAX® Theatre on a ship. Featured on Carnival Vista and a first for the fleet will be the New Engl and-inspired Seafood Shack, a casual indoor/outdoor dining venue near the Lido Marketplace eateries. This seafood-lovers’ paradise will feature a menu full of delicious, fresh favorites available for purchase, including lobster rolls, steamed lobster, fried shrimp, crab cakes, fried clams and more. “Carnival Vista celebrates the connection to the oceans on which we sail and gives our guests amazing seascapes around every corner and more ways to enjoy every moment of sun and fun during their cruise vacation,” said Mark Tamis, Carnival’s senior vice president of guest operations. The intimate Library Bar will also offer guests indoor/outdoor options, in addition to the hoppin’ RedFrog Pub and stylish Havana Bar. The ship’s main dining rooms, Reflections and Horizons, offer a tantalizing array of delicious menu items for guests who want to enjoy a full-service breakfast, lunch or dinner. The striking modern interiors created by award-winning designer BigTime Design Studios offer decidedly different decor than previous Carnival ships. The Horizons dining room will also feature a unique bar that’s the perfect spot for meeting friends and enjoying a pre-dinner cocktail or an after-meal aperitif. 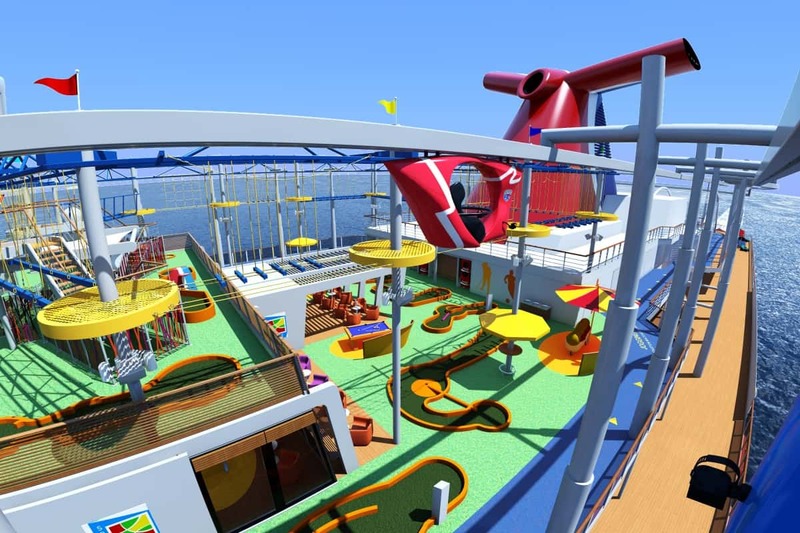 Carnival Vista will also introduce four new games at the family-centric HASBRO the Game Show, as well as special family-friendly comedy performances at Punchliner Comedy Club presented by George Lopez.